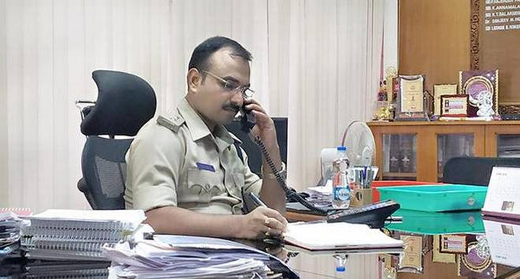 Udupi, June 16, 2018: Udupi Superintendent of Police Laxman Nimbargi said on June 15, Friday that a meeting would soon be held to discuss the changes to ensure safety on National Highway 66 consequent to a report submitted by experts from Manipal Institute of Technology recently. Speaking to media during the phone-in programme at the District Police Office Udupi here, SP Nimbargi said that the report was submitted a few months ago. But discussions on it could not be held on account of the Assembly elections. He would soon take up the matter with the Udupi DC Priyanka Mary Francis, so that a meeting with the National Highways Authority of India (NHAI) could be called, he said. SP Nimbargi said that the police would hold a special drive for a week, from Saturday, against two-wheelers, three-wheelers and four-wheelers using shrill horns and modifying the silencers of their vehicles. Since there were complaints about ‘matka’ in Byndoor region, the police will keep a vigil to check these activities there. When a caller said that some shops in Kollur were selling liqour illegally, SP Nimbargi promised to take action on the matter. Another caller said that some private buses were not stopping at the respective bus stands on the NH66 in Kota, Sasthan and Brahmavar, while at the Sasthan Toll Plaza, big tankers were blocking the road, SP Nimbargi said that action would be take in the matter. A caller said that drivers and conductors of private buses were not wearing their uniforms, SP Nimbargi said that a meeting of private bus operators would be called soon and the matter would be discussed with them. Another caller sought more buses on the Shankarpura-Innanje-Kaup route, SP Nimbargi said that the matter would be taken up with the departments concerned.